There is no shortage of forums and Internet groups where you can sign on and start asking questions or posting comments about goat keeping. This can be a wonderful way to learn and share information, but there is also the possibility that you will receive some seriously bad information. Answers are given to questions about situations that may not be clearly described. 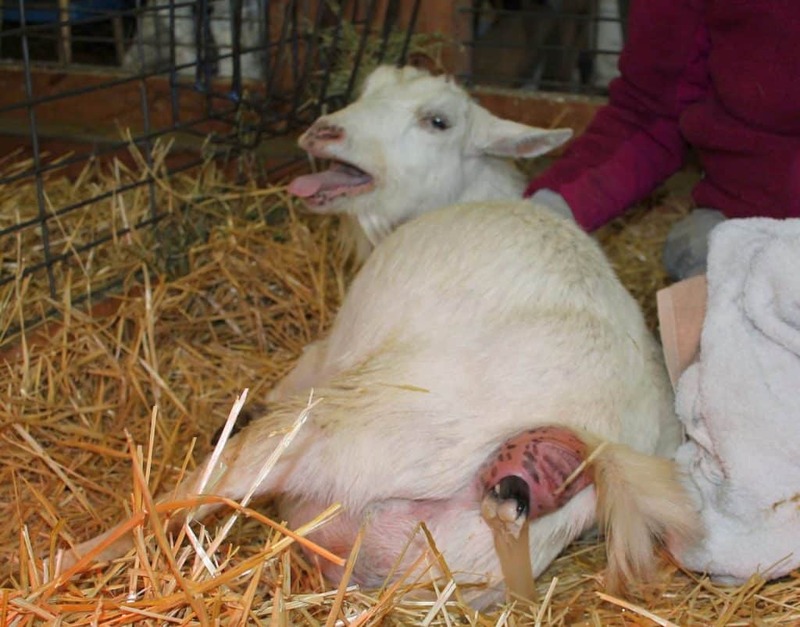 In the case of goat birthing complications, a lot of people are quick to suggest intervening in a birth without getting a clear picture of what is happening. Recently someone posted about a goat that had been in labor for 16 hours and then gave birth to three kids, two of which were dead. She asked if the owner should have intervened? Several people were quick to assume that the doe had been pushing for 16 hours and lambasted the person for not helping. Although I never say that anything is impossible, I am pretty sure that a doe would not push for 16 hours. If a doe has trouble birthing kids, they generally give up after a couple of hours of pushing. I know this because we are two hours away from the vet hospital, so we’ve only given up three times and headed down there, and in all three cases the does also gave up, and their labor stopped. I’ve heard other goat breeders say the same thing has happened to their does who were truly unable to give birth. When asked for clarification, the person posting said that the goat had only been pushing for a short time and never seemed to be in distress. This was probably a case where the owner misinterpreted the doe’s behavior, and she was not actually in labor for that long. More than a decade ago, as a new goat owner, I was on the receiving end of some bad advice a few times. I posted in an online group saying that I had a doe that had been in labor for a couple of days, and several responses painted terrible pictures of what horrible tragedy must have already occurred. Some strongly encouraged me to intervene and start pulling kids. Had I tried, I would have been unsuccessful because the reality was that the doe was not even in labor. She gave birth to three healthy kids the next day. In my post a couple of days ago, I mentioned someone who thought her does were in labor when in reality they were not even pregnant! If you use an online forum for goat advice, always include as much information about a situation as possible. I’ve seen people ask something like, “How soon after a doe passes mucus will she give birth?” which seems like a simple question. People may immediately start to respond, but the answer to that question is that it could be anywhere from a week to five minutes depending on how much mucus was actually passed. Too many people are willing to start offering advice without knowing the facts. When posting a question online, don’t simply say that a doe is in labor. Describe exactly what she has been doing and for how long. Vocalizing? Sounding angry? Or screaming in agony? Lying down, looking alert, with her head up? Or is she lying with her head on the straw and panting? How many days pregnant is she? Does she have an udder? Was she with a buck at any time after being bred? Many times I’ve seen people post a question online, which they think is a valid question — such as how do you induce a goat who is overdue — however, they ultimately learn that the goat is not due yet or not pregnant at all. If you have a health problem, it is best to describe the symptoms, rather than presenting a diagnosis. Last year someone bought several goats from me, and after a couple of months she sent me an email stating that a couple of them had ringworm and how should she treat it. Rather than simply giving her the medication info for ringworm, I asked her what symptoms she was seeing. She said they had hair loss on the backs of their necks, which is typically a result of goats sticking their heads through the fence too often and rubbing off the hair. As it turns out, that was the problem. However, hair loss in other places would mean a completely different diagnosis, such as lice, mites, or zinc or copper deficiency. Although you might think that posting a picture is a fool-proof way to get good advice, pictures can easily be misinterpreted. For example, the picture on the right looks like there are three hooves sticking out. However, there were only two. Posting a picture of goat and asking if she is pregnant or in labor is usually pointless — unless it is something as obvious as showing hooves sticking out, which someone recently did as a joke on Facebook. In a perfect world, you can buy goats from someone who is experienced and can serve as a mentor to you, answering questions as they arise. Of course, this person would also need to have a philosophy similar to yours. In addition, you should find a vet who is experienced working with goats. This can be challenging in some parts of the country. It may mean you have to travel more than a few minutes from home. For us, that means two hours, but I can also call them and get advice over the phone for situations that don’t require a trip into the clinic. If you do truly need to intervene in a birth, it is much better to be getting advice over the phone from a knowledgeable vet or mentor than from written messages in an online group. When you are in the middle of a complex situation, you really need the instant Q&A of a phone conversation. It is also better to be able to see someone actually perform a procedure, such as using a kid puller, before you actually try to do it yourself. I consider all of my vet bills to be educational expenses, as I always learn something from every visit. You can also read posts on some of the online goat groups, but remember that every bit of advice offered is simply one person’s response to a situation. It does not mean that it is the only answer or the best answer. And never do anything that you feel uncomfortable doing. Someone recently told me about a person on Facebook instructing someone to cut apart a kid inside the doe because it was breech. It is just plain crazy to tell an untrained person to do that in their barn! In cases where trained veterinarians do that, the doe often dies from a ruptured uterus. (I personally know of two cases where that has happened.) In situations that serious, a c-section is the preferred alternative. Even if you include as many details as you can think of, the people giving you advice may still not fully understand your situation. And remember that you have no way of knowing how much experience and knowledge anyone online has. People responding to your queries may have never even owned a goat, or maybe they’ve been raising goats for 20 years but have a philosophy that is polar opposite of yours. In a world where people write computer viruses for fun, it is not unreasonable to assume that some people online will give bad advice for entertainment. Ultimately you are the person responsible for your goat’s health and well-being. You are the person who will have to deal with the consequences of your decisions, and there are potentially negative consequences to every decision you make. Too many people online present treatment options as absolutes — if you don’t do X, the goat will die. Unless these people truly have perfected the art of seeing into the future, they actually have no idea what will really happen in your situation. Whenever you intervene in a birth, tube feed a kid, or give an injection, there is always a risk of something going wrong. So, you have to decide if the benefits of a procedure or treatment outweigh the risks. Well said Deborah! You've seen me say similar "hold on here folks, we don't know xyz" more than a few times. Good job! Now we need to post the link to this in many discussions online. Thank you! Feel free to share as much as you want! This very important for people to see! I have seen WAY too many cases people the wrong advice just because they did not have enough information. Thank you for writing this I will post the link around! I have a 2 yr. old Saanen bred to a Boer Buck, that was due from when we saw her get bred on March 14, 2018, with an average due date of Aug. 11, 1018! She has had a precautious udder for a month or more and we had to milk her once a day. Stopped milking her Aug. 01, 2018. She has bagged up some, but no signs of springing in the tail end or no mucus as yet. She appears to be some 5 days past the average due date? She was with the buck for another month after we saw her breed, could she have not taken and recycled when we did not see it? Yes, it is possible that she was not bred in March and is actually due three weeks later, if you had left her with the buck for a month after the first breeding. Or maybe she miscarried. Or she may not be pregnant at all. Or maybe she had a false pregnancy. The precocious udder situation is quite confusing. I’ve never heard of anyone milking a maiden doe in the middle of pregnancy. As I said in this post, you can’t just ask a question and expect to get the right answer for your particular situation. There are a lot of layers to your situation.